As in all dream-interpretation, attempts to comment on the meaning of this allegory may reveal as much about the interpreter’s own philosophical prejudices as about the story itself. “The distinction between dreaming and waking is no different from the differentiation, the debate, between life and death. The reason he could flutter about joyfully, following his whims just as he liked, was because these distinctions, and the temporary roles that go with them, are in each moment fixed, not at all because they is no distinction between them.” (Ziporyn, 162). There is a real distinction between life and death, giving each their full, autonomous reality. We don’t cross this barrier between life and death; our living self ceases at death’s boundary. Accepting and affirming the natural boundaries of our life, we fully inhabit its reality without trying to transgress into the next segmented phase of transformation (i.e. death – howsoever it may be). We are totally present in the authenticity of the here-and-now of living precisely when we don’t reflect on what may be beyond it. It’s the same with the distinction between waking and dreaming — or really between any segmented phases in a series of transformations — we affirm our present being when we fully lodge in its “temporary role,” not violating the limits currently enclosing it. Guo Xiang notes the butterfly has this down pat: it gets to ‘flutter about joyfully’ because it is emptied of mental reflection, with no grounds for devaluating its current phase of existence. Zhuang Zhou’s problem isn’t that he draws a distinction between phases of transformation; rather, he’s at fault for using his conscious reflection to try to bridge those phases and find some essential identity that connects them. By clinging to the hope of some essential, indivisible self which persists across transformations, Zhuang Zhou ensures that transformations will sow sadness, doubt and loss (death is only a sorrow to those clinging to life). So the Zhuang Zhou who wakes up is indeed Zhuang Zhou, real and authentic, ‘solid and unmistakeable.’ At the same time, the butterfly “happy with himself and doing as he pleased” is really a butterfly. There are no grounds for devaluating either phase, because each fully occupies its own position within an ongoing process of transformation. Each identity comes into and out of being along with its temporary role — a role given full shape by its boundaries. Zhuou is of course himself when he awakes, but that self will be no more when the next transformation comes because change literally turns one ‘I’ into another. Thus, acknowledging distinctions isn’t futile in the face of inevitable change; rather, affirming and accepting the boundaries of our being allows for the “Transformation of Things” to run smoothly. To me, that’s the big point of Zhuang Zhou’s dream: it teaches the Daoist conception of change, in which each phase fully inhabits its own rightness by lodging within its limits. And how can Zhuangzi see both sides, butterfly and Zhuang Zhou? Wouldn’t he have to be at the center of these changes, a sort of zero-perspective that accepts each phase’s being without judgement? 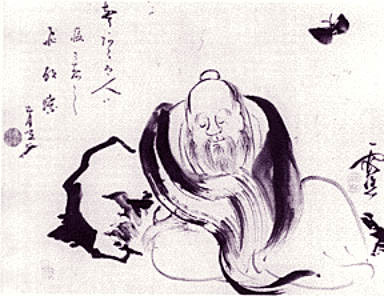 Zhuangzi. The Essential Writings. Trans. Brook Ziporyn. Indianapolis: Hackett, 2009. Print.